Chevrolet is bringing things further into the digital age with an all-emoji press release. Emojis are small pictures frequently used in text messages to convey emotion. The new 2016 Chevrolet Cruze was announced in a press release Monday, and was decoded the next day for those who were unable to read the emoji message. Why did Chevrolet decide to write an emoji press release? Previously, Chevrolet’s attempts to reach a younger demographic have been underwhelming. Creating an all-emoji press release was their way of appealing to the demographic that would have the greatest likelihood to buy a car that is priced around $16,000 such as the 2016 Chevrolet Cruze. According to PR Daily, Chevrolet’s new technique will likely bring in more interest from the targeted audience for the new Chevrolet model. With this departure from a normal press release, PR Daily said Chevrolet is trying to attract younger consumers who use emojis often. 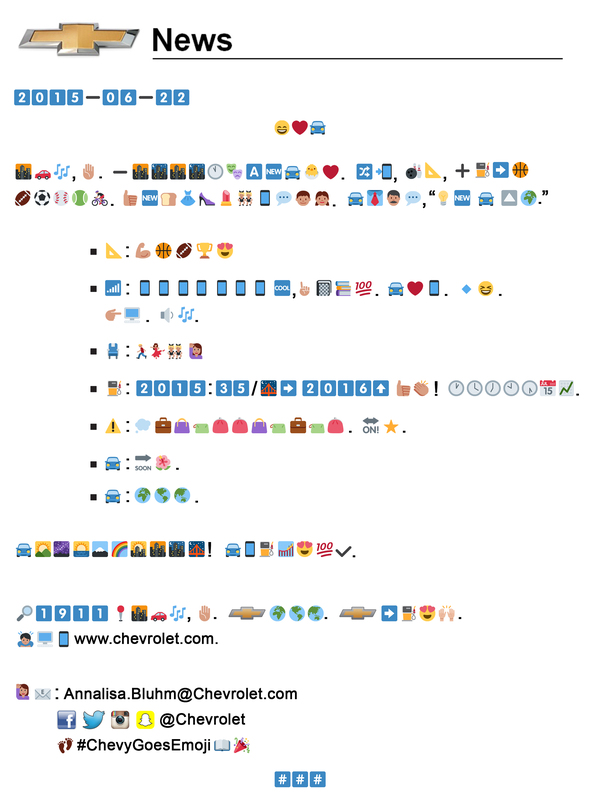 Chevrolet was able to create a press release that not only drew the desired attention, but required active participation for those who were interested in attempting to decode the emoji message. The car brand also took to Twitter to tease their press release by using even more emojis and the hashtag: #ChevyGoesEmoji. Commercials starring celebrities Norm Macdonald, Zendaya Coleman, Jamie Chung and Ashley Benson were posted on Chevrolet social media accounts. The commercials show the young celebrity women teaching the older generation how to use emojis. Chevrolet’s goal was to reach a young demographic who can afford a car like the new Chevrolet model. Because consumers respond more favorably to celebrities that they recognize, Chevrolet chose young celebrities that are popular right now and are heavily followed on social media for the campaign. The celebrity and consumer interaction on Twitter is evidence that Chevrolet succeeded in making their announcement interactive. Twitter was torn as to whether the press release was effective, but it definitely drew attention and sparked a discussion. The method was attention-grabbing, but even though this was the first time that emojis have been used in PR, other companies have used emojis as part of their marketing strategy. According to Mashable, today’s marketers have to “speak their language” to appeal to the younger generation—and emojis are part of the language. According to Digiday, many companies are trying to be more appealing to the younger generation. Companies are using trendy words like “fleek” and “bae” in attempt to appeal to the younger audience. The incorporation of pop culture into marketing shows that marketers have realized that the younger generation is becoming increasingly important to business. 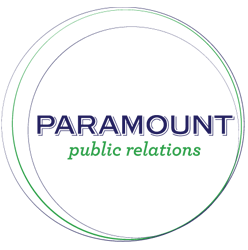 Will other companies follow suit and get creative with their press releases? Paramount Public Relations, Inc. has been assisting with the launch of Beckett Simonon’s new Goodyear Welted collection, which contains beautiful, high-quality men’s shoes for under $139. Beckett Simonon is a a leading online retailer of men’s footwear that sells high-end footwear, including their new Goodyear Welted collection, at an amazingly affordable price. What is Goodyear Welt? A type of shoe construction that is the gold standard for American, high quality shoes. However, most Goodyear Welted shoes these days are well over $300 and not in the budget for many men. But Beckett Simonon footwear is styled for a “new breed of gentlemen” that want to look dapper but are also price conscious. Thanks to Beckett Simonon’s direct-to-consumer business model, Beckett Simonon is able to offer their shoes at an affordable price without sacrificing quality. Instead, Beckett Simonon is taking the extra money needed to go through retailers and putting it right back in the customer’s pocket. Plus, free shipping! For more information, visit www.beckettsimonon.com! Beckett Simonon, a leading online retailer of men’s footwear, announces the launch of their new Goodyear Welted collection, which is available for under $139 thanks to the company’s unique direct-to-consumer business model. Styled for a “new breed of gentleman,” Beckett Simonon is ideal for American men who want to look dapper but are also price conscious. As the American gold-standard in quality shoe construction, Goodyear Welt construction* is most commonly found in expensive shoe brands that typically cost more than $300, however, since Beckett Simonon bypasses all “middleman” retailer costs and ships all their products directly to consumers free of charge, they are able to offer their Goodyear Welted collection at an affordable price without sacrificing quality. “Beckett Simonon is a great alternative for guys who want to look dapper but are also price conscious. Good style doesn’t end with a nice suit or well-fitted clothes, there are also shoes, but very few guys can afford to spend $300+ on a pair of fine shoes,” says Nicholas Hurtado, lead designer and co-founder.